We’ll provide you with everything you need to know about religious life on campus - this is information you’ve never heard before plus advice on comparing schools, and how to make the most of the college experience. Download our brand new campus guide which includes updated campus profiles and student-written articles that discuss everything from being a student leader to thriving on campus as a religious Jew. Watch our online college night webcast when it goes live on February 27th. To access the free guide and be notified when the webcast goes live, please fill out the required fields below. If you are headed off to college then you need the facts. OU-JLIC has provided everything I needed to keep going strong." "By being involved in OU-JLIC and contributing to the greater (QC) community at large I have seen a lot of growth within myself - I now recognize my strengths and potential." 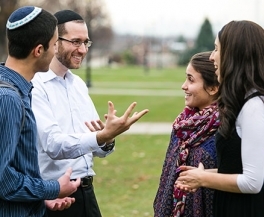 First-hand stories of Shabbat spent on and off campus. Experiences and advice on navigating the environment as an Orthodox Jew. A list of campus pros and cons to help you determine which one best meets your needs. This is the must-have college guide for religious students. Copyright Orthodox Union 2019. All rights reserved.